Manners Monday: A Meal Behind the Wheel? 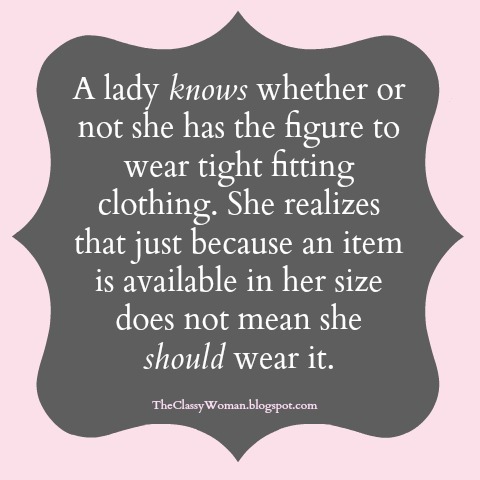 Today's Manners Monday post is a shorter one, but it's one that we're all faced with. 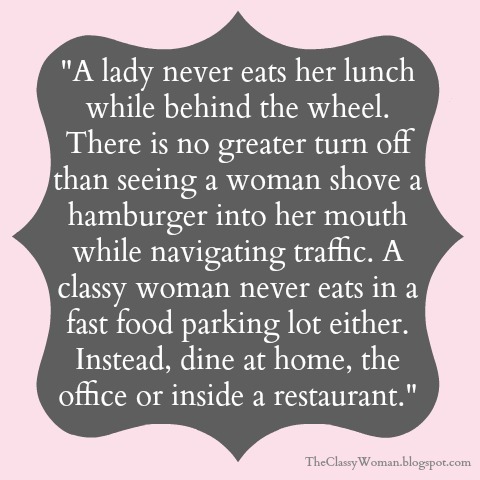 It's really a gentle reminder that true ladies never eat a meal behind the wheel of a car. I've sat at many traffic lights and turned to my right or left and watched a woman shove a hot dog, hamburger or handful of french fries into her mouth. It always makes me cringe. While there is nothing wrong with the occasional fast food treat, there is something wrong with eating one's lunch or dinner while in the driver's seat of a vehicle. There's just something so crass and unappealing about it. It always reminds me of piggies gobbling down their daily feed-it's anything but feminine, ladylike or elegant. There are also the folks who zip through the drive-thru only to park in the fast food lot and eat their meal on their lap. When I park somewhere to go inside I always feel a bit sorry for that person that I see as I get out of my car-they always look so lonely or as if they need to feed their food obsession in private. One way to eat in a more ladylike and polite manner is to eat with others, such as your co-workers or a with a friend over lunch. When proper utensils are required, sitting up straight, placing a napkin in your lap and dabbing your mouth with it when necessary along with other proper table etiquette become routine. Instead, make the time for a proper breakfast or meal where you can sit down and chew your food and digest it properly. If you must eat on the run, take an extra 10-15 minutes the night before to prepare something that's easy to eat while you're still inside your house getting ready such as a bowl of cut fruit, a muffin, yogurt, etc. Eating in the car is not only tacky but it can be dangerous. Remember the scene from 'The Wedding Planner' where Jennifer Lopez nearly gets run over by a cab driver who is desperate to save his ice cream from falling off the cone and choose to pay his attention to it instead of the road? It can also cause food particles to fall between seats, under the seat or mats or in small crevices that are hard to clean and it can create an unpleasant odor in one's car which is not very appealing. Here are 5 tips on keeping a clean car. No matter how hungry you are upon picking up take-out, resist the urge to eat it until you are home. You'll enjoy your meal a whole lot more that way. By keeping a small container of almonds or other nuts in your car and a bottle of water on hand at all times, you'll have a perfect little snack that will keep you feeling full so you won't feel the need to go through a drive-thru or snack on your take away meal while on the road. What are your thoughts on eating in one's car? If you have to, what types of things do you limit yourself to while in your own vehicle? Today's thought is short and sweet as the quote above pretty much says it all. I hope you all started your morning with a little bit of red, pink, hearts or something sweet. :) For anyone who enjoys a little DIY, above are some fun and inexpensive ways to show your love. Why not plant a pot of pink petunias and attach a message for the recipient to plant in their own garden to watch your friendship bloom. :) Sliced strawberries on skewers with the hulls pulled out make cute hearts for adults and kids alike. Feeling crafty? 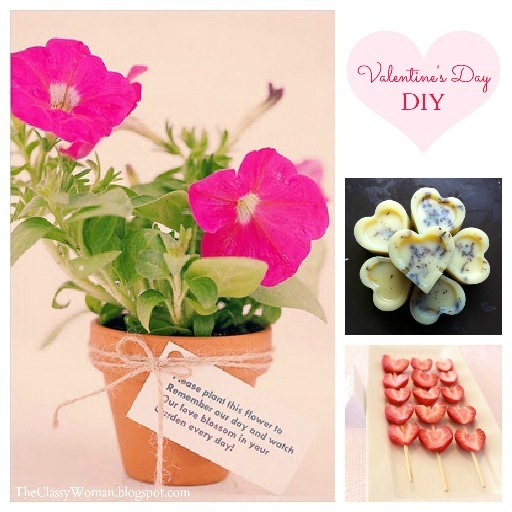 How about making some heart-shaped lavender bath melts for someone special in your life? Here's the recipe via the blog 'Be Beautiful'. As we celebrate this day of love, I wanted to wish you all a lovely Valentine's Day! 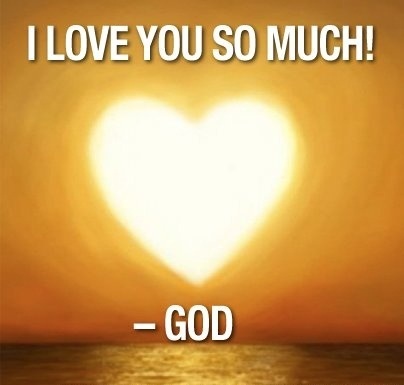 May each of you ALWAYS know just how much you are truly loved! We're switching things up here for today's Fashion Friday with a guest post from a celebrity stylist! 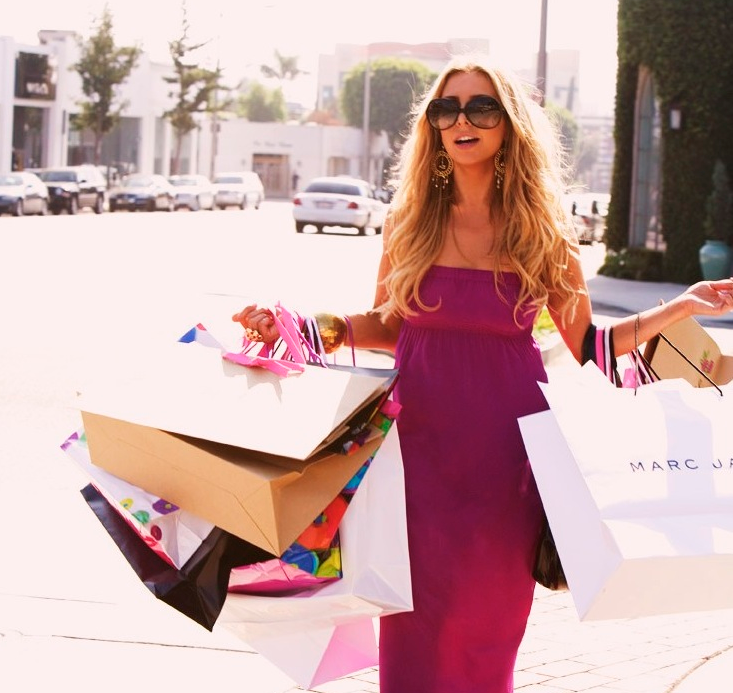 Let me introduce you to Anya Sarre who is one of Hollywood's most influential trendsetters. A nationally recognized celebrity Stylist, Sarre is known for her impeccable eye and ability to tie any look together with the perfect accessory. Named "Best Television Fashion Stylist" for her appearances on Entertainment Tonight, The Insider and countless other media outlets, Anya is the go-to fashion expert for Hollywood's biggest celebrities. Fashion trends this season offer variety and volume: velvet, fur, leather, and print! Whatever items you choose to elevate your wardrobe, you are not done shopping until you have invested in the perfect outerwear and shoes. Consider retro chic, modified trench coats with an eye to accessorizing for a feminine finish. High-waisted trousers with wide legs in a range of earthy tweeds are cozy basics this season. Accentuate this androgynous piece with a tailored Oxford shirt, a necktie, and even a vest or sweater thrown over the top for added warmth. Choose a brown plaid wool trench coat with cuffs and detailed buttons to ward off the chill; for the fashion bold, don a bowler-inspired hat in a coordinating color to draw attention to your feminine features. A metallic or leather briefcase in lieu of your handbag with elegant short booties finishes the look. The winter runways are teeming with a melody of fabrics and textures. If the luxury of velvet, leather, and fur elicits a soft sigh from you, consider adding pieces to your closet that will keep you purring through the dark, cold months to come. Choose black or basic gray for the bottom. Skinny leather pants, a leather pencil skirt, or even tone-on-tone patterned coated leggings pair well with a simple tunic or a silk blouse in a jewel tone—like burgundy or jade. When bracing for the cold wind, look for a plaid trench coat with a wrap closure. 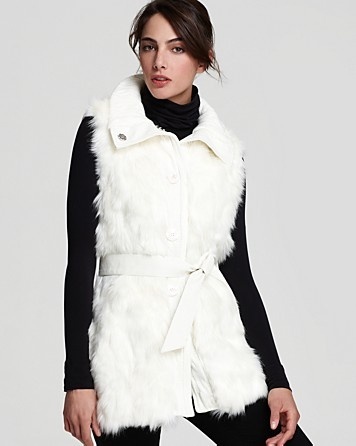 An asymmetrical fur collar adds visual interest and a touch of elegance. Black leather handbag and matching pumps are the final touches. This season the sixties are hitting the scene. Top a playful pink mini-skirt with white tights and a fitted white turtleneck. Accessorize with round white sunglasses—for a Jackie O inspiration—a silver vintage chain, and black leather knee-high boots. For venturing in the outdoors, choose a shorter fitted trench with a side button closure. Look for a trench with a scalloped collar and pair it with a fun black beret and elbow-length leather gloves. Whatever your personal style, there is a fun trench coat that will add warmth and pizzazz to your wardrobe. Be adventurous and try on something unexpected! You may find the love of your winter. Thank you so much Anya for your fabulous tips, it was my pleasure to have you guest post here on The Classy Woman blog today! If you'd like to read more of Anya's fashion advice, here is her website. As a Canadian gal who has braved many cold winters and knows the importance of keeping warm and dry, if you live in a really cold climate and warmth is your number one factor along with a pretty fur-lined hood, I highly recommend looking into Canada Goose Jackets. You don't have to live north of the U.S. border to appreciate them, I know many of you around the globe cannot wait until spring but until this long and crazy winter weather comes to an end, this will be your warmest option! 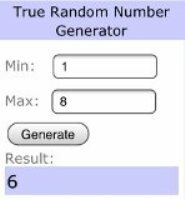 A-Thread Clothing Review & Giveaway! In the end I married practical and pretty by ordering this purple peasant top in size medium which I've already worn twice! Spring is all about fun prints and I especially like the color combinations and design of this top. I love that it can be worn with so many different bottoms I have in my wardrobe: white denim cuffed capris, red skinny jeans, purple skinnies, dark wash skinnies, white shorts and more. You can see the two different ways I wore this outfit, using the same handbag but different color and length of pants, shoes and accessories. (For the purpose of this post I took photos for both looks on the same day.) * I apologize for the somewhat dark photos, hubby took the pics in our front hallway on my pocket camera and it was a cloudy day. My top arrived quickly and was beautifully packaged in hot pink tissue and pretty twine. As a fun addition, the kind folks at A-Thread sent me a pair of gold leaf and turquoise bead earrings also! I'm in love with this loose billowy top and want to share the a-thread love by giving a pair of these lovelies below away to one lucky reader! In case you're wondering, they're 1.5" in length total. 1. Must be a public follower of this blog via GFC (Google Friend Connect) via my sidebar. 2. 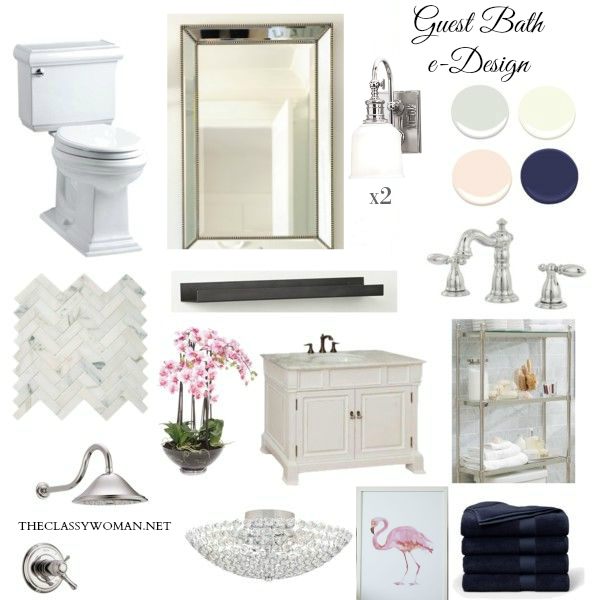 Visit the a-thread website and tell me what item is catching your eye for Spring. A big thank you goes to A-Thread online clothing boutique for providing my lovely top to review and for giving me the opportunity to give away a pair of their earrings! Here's a previous post I wrote about How to Dress Classy on a Budget, including tips on what basic staples are essential in everyone's closet and wearing what fits your body type. If you're a new mom and struggling with what to wear so you look 'put together' while still being practical, you'll appreciate this post I created on How to Dress Classy as a New Mom. Thanks for Reading! If you like what you read today, tweet it, pin it or share on Facebook with our new share tools right below this post! We all have our own interests, many of us try to learn as much as we can not only for ourselves but sometimes in an effort to help or educate others also. While this is often a blessing to others many times, it can sometimes be a curse if our approach isn't handled properly. It's important to speak the truth but it needs to be done in love. If you follow our Facebook Community, then you've probably already seen this image and quote this morning (I meant to post this yesterday for Manners Monday but it was left in draft mode so while it's really Tuesday, I backdated it to yesterday (Monday) to keep with our series). 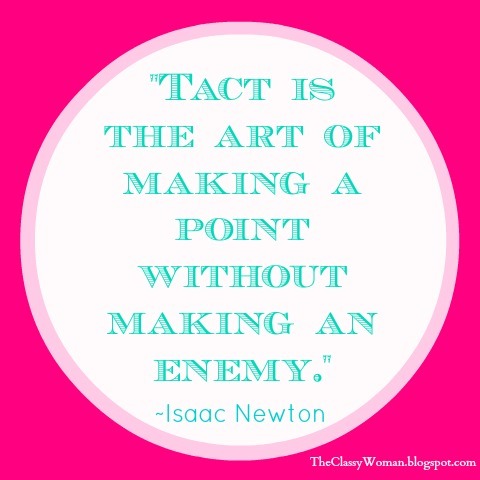 Today is all about tips on how to communicate effectively with tact, credibility and diplomacy. Not only is it a great skill to have for your professional life but it's just an all-around important life skill to master. Never let making your opinion known become so important that you alienate others in the process. We all have our own perspective and valuable insight, however, we need to be mindful to put ourselves in the other person's shoes! :) ALWAYS be gracious and kind not allowing yourself to act like a condescending know-it-all. (I think we all know a few of these people and they never leave anybody feeling good about themselves). 1. 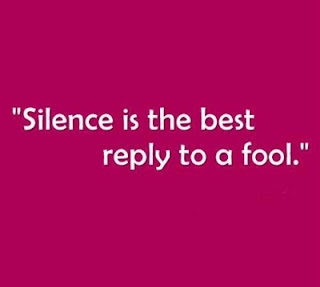 Listen More than You Speak- This is true with any kind of conversation, debate or argument. When one person does all of the talking, the others listening will eventually tune out not wanting to participate in one-way communication. Others' opinions should be heard, respected and taken into account before continuing with your own point. A conversation tailored around everyone's points makes the most sense and helps others feel included instead of ignored and as if you're a one-person show. 2. Know What you are Talking About- When we feel strongly about something, it's only natural to want to share our points of view with others, especially when it comes to potentially benefiting someone else in the process or forewarning them against something that could put them in danger, but as the one making a point it's important to know your stuff. Confidence through knowledge is key when sharing with others and always will sense it. If you're discussing politics, don't just throw silly opinions into the mix without facts to back it up, you'll only get others in an uproar or cause confusion. Perhaps you want to encourage someone's good health, be sure to know the precise points that pertain to them and how it can help them, not cause undue stress. Instead, choose to pursue conversations and make valid points based on actual knowledge in that particular area. It's hard to be diplomatic if your'e making flippant remarks that really have no basis. 3. Think Before You Speak-A classy woman doesn't insult others while trying to make her voice heard. She spares others her unsolicited advice, does not become pushy by speaking over others and making mean remarks to prove her point. Nobody will listen to or respect anyone who treats another in such a manner. It is both the choice of words you use and the tone in which you use them that will speak volumes to the others around you and show them how much you value and respect them as a person over you own perspective. Ask yourself: Is it helpful, is it kind, is it necessary? 4. Check Your Emotions at the Door- We are human, we have feelings and for women especially, we can tend to be emotional at times. When it comes to a hot debate or discussion of sorts, we have to remember that we cannot let others' opinions feel like the rejection of our own. No matter what the topic, you'll never have 100% of people agree with you, so trying is futile. Sometimes you just have to learn to agree to disagree. I believe this point is what causes a lot of hurt feelings on both sides, feeling as if others' not agreeing with you means that they are against you. These feelings can cause retaliation and lead to something bigger in an attempt to protect one's ego. Just remember that it's a difference of opinion, everyone involved are adults and it's not worth losing your cool over. 5. Acknowledge Another's Education and Perspective- One of the greatest experiences and benefits of good communications is coming away from a conversation learning more than you knew going into it. When conversation is kept respectful; even when it's in the form of a debate on child rearing techniques, the state of our environment or politics, it becomes a joy instead of a burden and it keeps us coming back together for more. It is in these moments when we feel appreciative, that we need to thank and acknowledge the others that participated. It doesn't need to sound formal or stuffy at all, just a simple, "I'm really glad that you shared that today, I had no idea that was even an option for our family". Another great phrase is, " I always learn so much from you" or "you're a wealth of knowledge on natural health remedies", etc. Obviously you don't want to encourage a rude, overbearing person who dominates a conversation by praising them in this way for the sake of being polite, save such sincere compliments only for those who truly deserve it. After all, we feel good when others recognize us in some small way. I'd love to hear your feedback in the comments below! As most of you know, I'm already married so today's post is not a nod toward a big day of white in my own future however I do love seeing all of the beautiful gowns available, the styles have changed so much over the past 6.5 years since I said "I DO". The dress shown above with the beautiful lace and exposed back is just lovely and represents what I would choose if I were to do it all over again today. :) The elegant lace is so romantic, I love how it loosely drapes over a fitted white underlay topped with the perfect amount of tulle and a pretty bow just underneath the beautiful back opening. 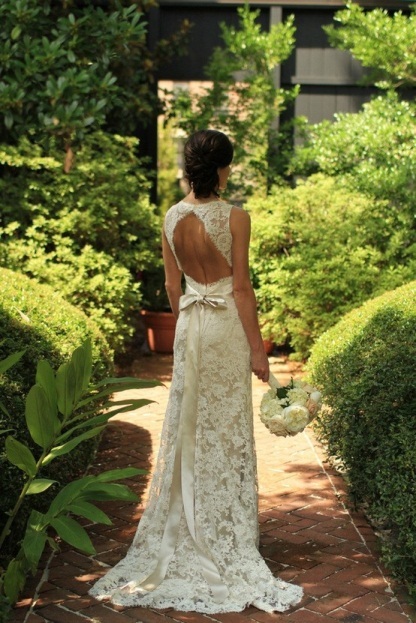 The dress shown under the 'Keyhole Back' category below is another favorite. As spring is just around the corner and many brides plan for spring and summer weddings, I thought today's post would be helpful for any brides-to-be out there looking for a little inspiration. 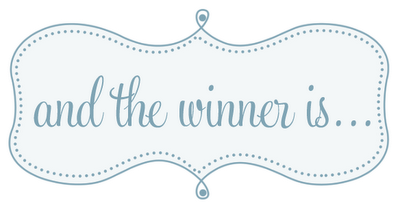 Today I have the lovely Rebecca writing today's guest post. Wedding Gown Trends for 2013 If you plan to tie the knot in 2013, you have likely already begun your search for the perfect dress. When you don that special dress on your wedding day, you want to be sure the guests will be unable to turn their gaze away. You want to be the envy of your bridesmaids, and your groom should be the envy of all his mates when they see you walking down the aisle. For a little help in picking the perfect dress, take a look at these top trends for the year. The peplum flair made its way back into the fashion world with panache for the spring of 2012. In 2013, designers have incorporated this trend into wedding gowns for an array of figure-flattering looks. Proportion is key to the perfect peplum wedding dress. A particular fashion favourite is a fitted gown that flares just above the knee and features a cropped peplum waist. Taller brides may choose a similar design featuring a longer, asymmetrical peplum. 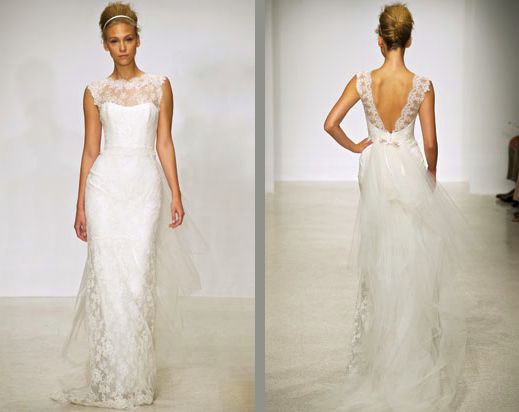 As in 2012, the brides of 2013 will be wearing lots of lace. From heavy brocades to gauzy lace overlays, this is one bridal statement unlikely to go away soon. The variety of options this year are unparalleled, and whatever your personal style, you are likely to find that the perfect dress comes with a healthy helping of lace. Designers such as Jason Wu have been incorporating feathers and feathery detail into his designs for a few years now. In 2013, many modish wedding gowns feature feather accents. Some brides will enjoy the cutting-edge look of feathers in the skirt of a gown while others may prefer a twist on a more classic style with feathers to accentuate the collar, neckline or sleeves. Feathered jackets or wraps are another way to incorporate this trend in bridal attire. Much like spot color on a black-and-white photo, splash color on a wedding dress provides additional interest and allure. Choose from ornate gowns with bold color in the train or delicately colored fabric roses and other accouterments. Most of the seasons splash color gowns feature long trains and wide skirts as well. For brides who are a bit flirtatious, the keyhole back offers a touch of fashionable fun. Wear your hair up or keep it short for your big day, and let your luscious skin peek through tailored openings across your back. These dresses generally feature sleeves and shape-hugging design, and many feature skirts that flair at or just above the knee. Whatever your personal style and regardless of your body type, the bridal fashions of 2013 are sure to contain the perfect dress for your special day. The assortment of peplum styles, lace accouterments and other design elements now available ensure that any bride has the option of looking her best in a fashionable wedding gown. These fashions are certain to steal the show, so you can rest assured your beautiful bridesmaids won’t be upstaging you. Author Bio: Rebecca is a fashion student who has aspirations to design her own wedding gown collection and run her own specialist wedding boutique, she also works for Samara James helping people find the perfect diamond engagement ring for their loved ones. You might want to consider hiring a fashion Stylist to get your outfit right for any occasion. *images selected by me to represent the 2013 wedding trends. sources: (1), (2), (3), (4), (5), (6).